Quests are sorted by where they are assigned or by which faction assigns them. 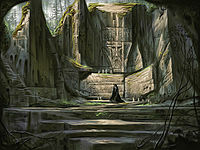 Skyrim also offers hundreds of smaller quests, all of which are listed under Miscellaneous Quests. 8 achievements are obtained by completing the Main Quest. Some categories of quests can be distinguished by the decorative knotwork displayed alongside the quests' titles in the Journal. This page was last modified on 24 March 2019, at 17:20.